This entry was posted on March 28, 2015 at 9:13 pm and is filed under iPad art, poetry, Uncategorized. You can subscribe via RSS 2.0 feed to this post's comments. What a perfect poem, I always struggle with the envoi myself, and the poet’s freedom is always there. I admire how you weaved the myth into your words, and the words you’ve chosen are super brave. The pomegranate and granite especially so. You have let the form guide you gently into something new. An amazing poem really. Thanks so much, Bjorn. It was a good challenge–I find these sestina like things very hard – but they are always intriguing; and you gave very good advice re the words. k.
Ah, you wove the myth into the form very well. Not very easy to do but well accomplished. I’m so impressed that you were able to craft such a flowing poem from this difficult form! And you were able to use the word “pomegranate” so many times without it seeming to be overkill! I felt certain that you would work your signature magic on this form, Karin. What a beautiful mosaic of words you have rendered. Thanks so much, Kerry. It was a very interesting challenge! A super grey – still wintry day here –5 degrees this morning, and similar yesterday–that put me in that mood. I think that maybe I should say the ground dried rather than froze in the last stanza before the envoi, but it is all so frozen here, it is hard to think in terms of anything else! k.
A pure pleasure the way you’ve taken the chosen words and made them speak in all their tones of voice, in phrases that both narrate and describe, delineate and expand the premise–a classic myth, retold so that its hidden facets shine under a modern sun–even if it is a very dim and cold sort of light. Really excellent poem, with the form, and independent of it. Thanks. You should see some of my other attempts–all informed by this dratted book on clutter–and heavy on all the wool socks I would refuse to throw away. I finally decided those really weren’t working, so decided that one could always come up with something going classical—k. Thanks so much, M, and thanks for all your kind comments. k.
A nice story, k. I am not up very well on the mythology so I check with Wikipedia when I come across the Greek for sure. You summary of a ‘drafty’ poem caused a smile. Mine was drafty as well, not time for mellowing or hardly proofreading. Long live Σιτώ! Your red pomegranates picture was nice as well..
Wow! 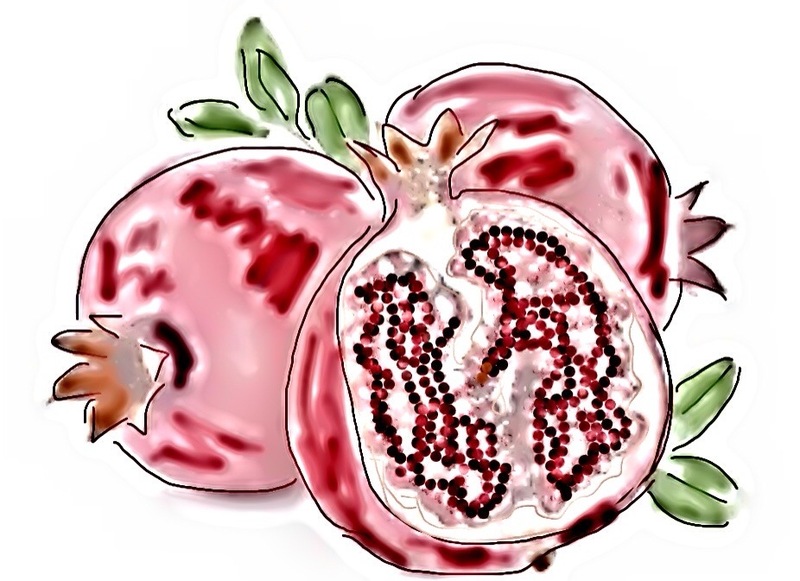 Your artful telling and the turning of pomegranate into palm of granite is brilliant. This telling of the myth is a Mother-gift as it takes the heart of Demeter and reveals the ache of her protest. This is my favorite myth for that bond mother to daughter and your rendering rocks it.